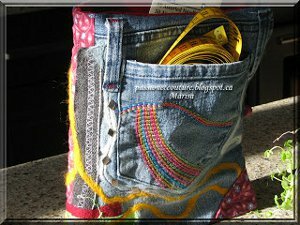 Turn an old pair of jeans into this useful Denim Needle Case, great for storing all your sewing supplies. 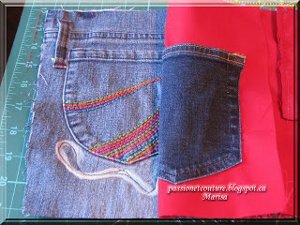 This is a fun project for Earth Day and a fun way to upcycle that old pair of jeans that you've been meaning to throw away for a while now. 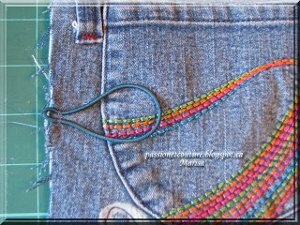 You can embellish this needle book however you'd like, and reuse those pockets to store even more supplies, like snaps, measuring tape, sewing patterns and more. It all started with the idea of ? 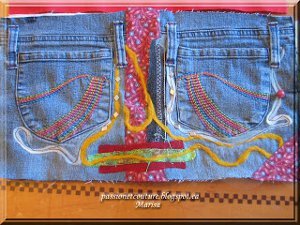 ?recycling this pair of jeans, when my daughter gave them to me because they did not fit, the first thing I noted was the beautiful pockets, and I have kept them with the idea of creating something whenever inspiration would come. Analyzing the various parts of this short I found the pieces I wanted to use. First stage disassemble all the parties I will be able to use later. 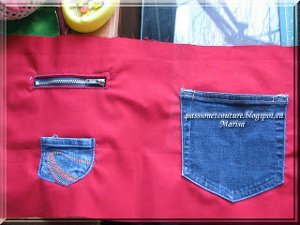 First, I used the back pockets to create a piece of fabric, that will become the front and the back side of my needle case. 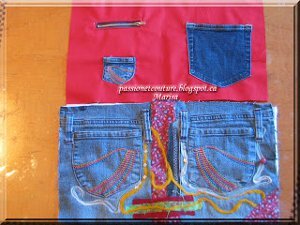 The measures do not matter as it depends on the design of the pants, you can cut a bigger or smaller piece or just cut two squares. Just to give you an idea, my pieces are 8 "x9". I cut the two pieces and between them I sew a strip of fabric 2.5 "wide. 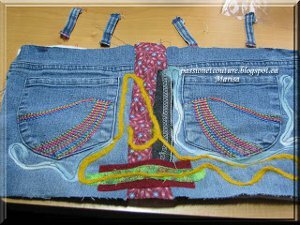 Then I started to embellish my project, I used my embellisher machine to add some roving wool and I also added some scraps of fabric. 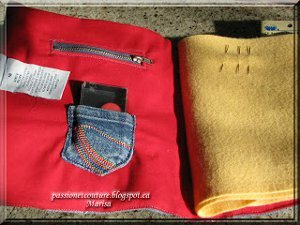 To make the inside of the needle book, I took the measure of my external part already finished, and cut a piece of red fabric with the same measures. I think the contrast of colors is nice. 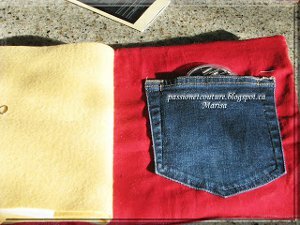 On one side of the needle case I decided to make a pocket, with, what it was before, the zipper of the pants, and added another pocket I had from another pair of jeans. Now I have the outside and the inside ready to sew them together. Before sewing them together, I cut a piece of interfacing, because I wanted to give a little stiffness to the outside of the needle case and also sew a button. 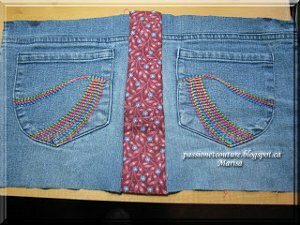 Take the two pieces, place right sides together, aligning the row edges, added a hair elastic in between the outside and inside of the opposite side to where I added the button and sew, leaving 4" or 5" of the bottom open. 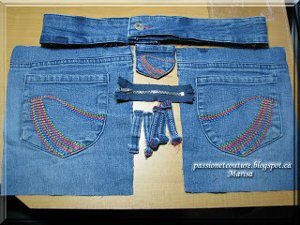 Turn right side out by pulling the fabric through the opening , and sew the opening, I did with my sewing machine. For the inside I just added two sheets of felt I had, cut them to fit the measure of my book and sewed with the machine. 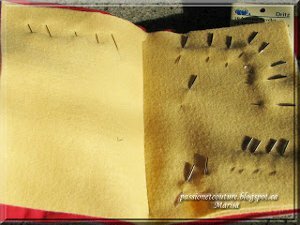 I have sewn them in the center, in the place that would be the spine of a book, simply by using a running stitch. Everything is now ready to fill it with needles and other sewing accessories. I love sewing notions of all shapes and sizes. I also love to organize. This project is perfect for me. 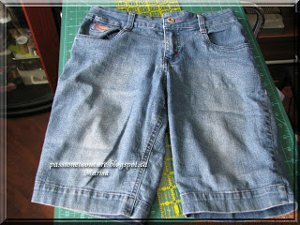 I am searching for projects that use old denim, and this one is perfect. 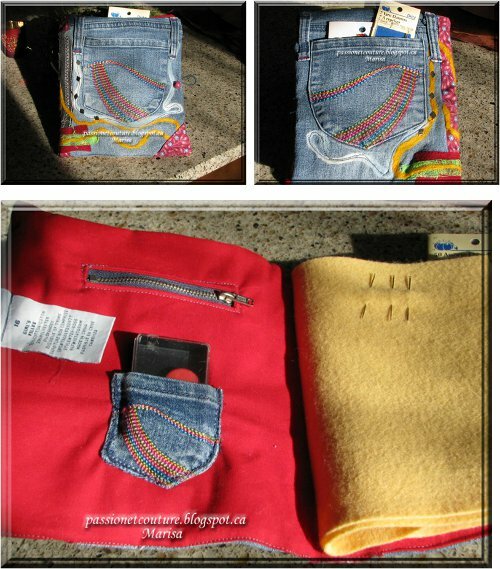 I love how the many parts of the jeans were used to make this book. I wonder if I could make a junk journal using the same idea?